St Catherines Church ChurchThe history of St.Catherines church begins with a meeting at the Station Hotel on the 19th November 1881 when it was decided that a church be built to accomodate 250. This church became known as Holy Trinity. Due to the works and the population expansion it was decided another church was necessary so on 13th of April 1911 the decision to build St.Catherines was agreed. At the Easter Vestry of the 18th April 1913 a formal protest against the disestablishment and disendowment of the Welsh Church was made. It was announced by the vicar, Rev W.Morgan, that as from the following Sunday all the services in Holy Trinity would be in Welsh and all English services would be held at St.Catherines Misson Room. 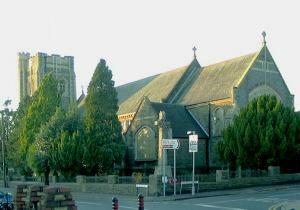 On 29th May 1913, St.Catherines Church was consecrated and dedicated by the Lord Bishop of St.David's. In succeeding years the beauty of the church was further enhanced by the installation of the Chancel Screen, Reredos, Processional Cross and Pipe Organ. In 1929 the foundations for the Church Hall were laid. This was being built by Mr. W.Rufus Lewis as a memorial to his brother Colonel David Lewis, who was one of the founder members of the church in Gorseinon and for many years Church Warden of Holy Trinity. In 1936 the Mothers' Union was started in the parish and is still strong today. They have worked hard on behalf of the church ever since. To this day a lot of changes have taken place and with dwindling numbers Holy Trinity was closed and sold, but the name has not been lost. The Lady Chapel in St.Catherines was dedicated Holy Trinity Chapel and services in Welsh continue there today. Fund raising activities for Christian Mission work have gone from strength to strength and one such activity required the congregation to raise £65,000 so that along with a grant from the Lottery Commission we could carry out much needed repairs to the West Wall and tower and to this day they have once again come up trumps. Evidence that the pastoral life of the parish is vigorous can be seen by the various groups using the church:- Mothers' Union/Ladies and mens Groups/Bowls Teams/Ramblers group/Ecumenical and social concern group/Bell Ringing/Flower group/Fabric Group and The Bridge Club which brings together the physically and mentally handicapped with the able bodied and great a greater awareness is both encouraged and admired. St.Catherines is fortunate in having a bell tower with a peal of eight bells consisting of a Treble,Nos,2,3,4,5,6,7 and Tenor, the latter weighing 91/4 cwts. Made by Carrs, Smethwick, and cast in 1913 it is possible with such a peal to ring 5,040 changes. This has been performed on five occassions before 1939 and on three occassions since 1945. The history of St.Catherines church begins with a meeting at the Station Hotel on the 19th November 1881 when it was decided that a church be built to accomodate 250. This church became known as Holy Trinity.